A 66-year-old man was punched in the face and had his car vandalised during a road-rage row in the Borders this week. The attack took place at about 6pm on Wednesday, November 9, on the southbound carriageway of the A7 between Stow and Galashiels, close to its junction for the B710 heading for Clovenfords. The 66-year-old, driving a silver Hyundai iLoad pick-up truck pulled over to the side of the road there after another male driver, in a white and green van, signalled for him to do so. The pair then became involved in a verbal dispute culminating in the other man punching the 66-year-old in the face and smashing one of his pick-up’s wing mirrors before driving off. The victim is said to have sustained minor facial injuries but did not require medical attention. Police are appealing for any witnesses to the incident to come forward. 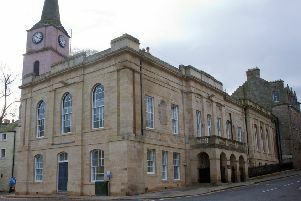 Constable Sarah Younger, of Galashiels police station, said: “This dispute and subsequent assault seems to have been over a relatively minor issue, but it resulted in the victim being assaulted and his vehicle being damaged. Anyone with information is asked to contact Police Scotland on 101 or make an anonymous report through Crimestoppers on 0800 555111.